We’ll have Forward 101 lunch afterwards and 242 Groups through out the day. What a Sunday! Bring yourself and a friend. We have an alive God to celebrate and enjoy! Easter 2017 – Jesus Changes Everything! “Jesus Changes Everything!” is our theme for Easter 2017. I can’t think of a more meaningful service of the year than our Good Friday Service. CIL will have a time of worship on Friday, April 14 at 7:00 p.m. I invite you to come as a family as we remember Jesus’ death and sacrifice for us. Service will last less than an hour and we will take communion as a church. Join me and my family in honor of Jesus to begin this special weekend. This Sunday is Easter. CIL leaders have been working on the building and property for quite some time to get ready for this Sunday. We will set out extra chairs, schedule more greeters, and print more Reviews. When all of us show up on the same Sunday like we do each Easter, it creates quite a buzz. Jesus is worth it! Jesus is more than worthy of this tradition, effort, and love. I look forward to seeing you at either 9am or 10:45am this Resurrection Sunday! We are in Holy Week, leading to Easter Sunday. The death of Jesus, and his resurrection, was the pinnacle of history. Everything changed after these events. Even the modern calendar is based off these occurrences (B.C. / A.D.). The most important question we answer in life is what our posture is towards Jesus Christ. I have believed that He is the son of God and the expression of God’s love for the world. I have made Jesus the Christ my sovereign. I follow His teachings, leadership and active presence in my life. This has been my greatest decision. My greatest honor. Eternal life has already begun for me though faith in Jesus. I am so grateful for this fortunate grace on my life. Still, I know that any human being who believes Jesus is God receives this same blessing. Please take time to reflect on what Jesus means to you this week. No consideration is more important. 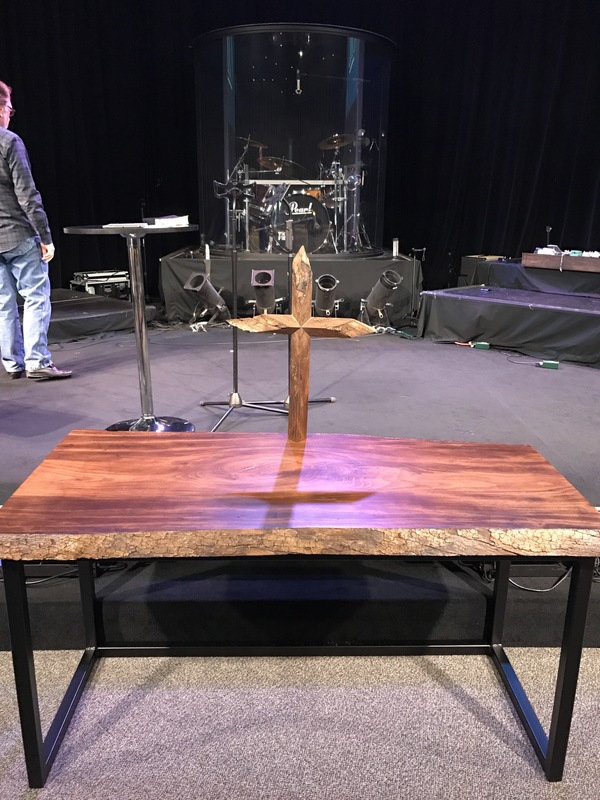 On Sunday we dedicated new communion tables to the Lord. Aubrey McGowan and Brian Gregory did an outstanding job creating the communion table for CIL. The table of the Lord is a symbol of our historical roots, the presence of God with us now, and the future reign of Christ when He fully asserts His kingdom. This table is made of wood from a Nashville sycamore tree. If you are even slightly interested in what Union University has to offer adult learners and dual enrollment high school students, visit the Hendersonville campus this Tuesday evening (April 4) to discover opportunities to grow academically in a Christian environment. I heartily recommend!